Dialysis can be tough on family dinnertime, especially when you want quick meals. Treatment schedules may make achieving a sit down family meal hard. When family members eat at different times and places, it’s easy to stray away from home cooked meals. You may be tempted to turn towards processed foods or fast foods that can be high in phosphorus and sodium. Instead of popping prepared meals in the microwave or resorting to fast food, try using a slow cooker or a pressure cooker for convenient, minimal hands-on cooking. These cooking methods can help make it easier to get a healthier, more balanced hot meal on the table. Bringing balance back to the mealtimes you have together is worth the effort. Plus, eating delicious, nutritious quick meals together is great for the whole family. Slow cooking or pressure cooking? A slow cooker cooks food very slowly, usually around 8 to 10 hours on low setting for most recipes. If you have more time and energy in the morning to put together ingredients for a meal, this is the way to go. There’s nothing better than coming home at the end of a long or busy day to a ready-to-serve dinner that has your whole kitchen filled with seasonal aromas. A pressure cooker cooks food quickly to save time when preparing meals. The pressure cooker traps steam created by heating the water or other liquid added to the food. As a result the internal pressure and temperature of the food goes up very quickly. There’s very little liquid loss when you pressure cook. Once you master this type of cooking you may find it is the best way to prepare your favorite quick meals. When choosing recipes remember both pressure cookers and slow cookers work using the moist-heat cooking method. This method uses water, liquid or steam to transfer heat to food. The best recipes are often those that contain some liquid. When adapting a recipe for pressure cooking, follow your pressure cooker’s instructions to adapt the cook time correctly. Soups and stews are easy to adapt to pressure cooking. For example, for the recipe Cream of Chicken Wild Rice Asparagus Soup , you can cook the rice separately, prepare the veggies and chicken and assemble in a slow cooker, then cook on low until you are ready to eat. For food safety reasons it is not recommend to reheat food or leftovers in a slow cooker 1. Also, thaw frozen meat before placing in a slow cooker. Otherwise the meat may stay in the “danger zone” for too long and bacteria may grow before it reaches a safe cooking temperature. 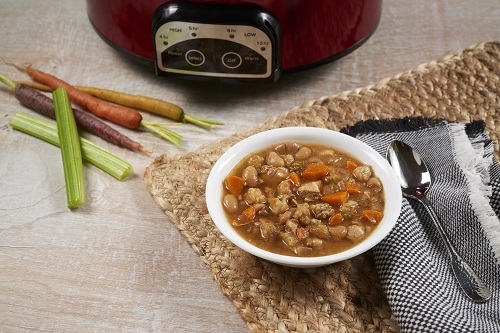 For starters, try Crockpot® Chicken and White Bean Chili, a seasonal slow cooker recipe from the “Today’s Kidney Diet Fall Comfort Foods” cookbook. Here are some additional recipes to try in a slow cooker or pressure cooker. Hi: I love DaVita and all you do for us with faulty kidneys. Thank You so very, very much. I would love to try the pineapple glazed crock-pot chicken thighs. I live by myself. Would you be able to break the recipe down to two or four servings please. The easiest thing to do is divide the ingredients in half to make 3 servings–one for now, one for tomorrow and one to freeze for a quick meal later. Another option is to use DaVita Diet Helper to recreate the recipe. Us the My Creations feature–>New Recipe and enter the divided ingredients to see the nutrients for the smaller amount. I recommend keeping the chicken broth at 1 cup so there is enough liquid. I have been diagnosed with kidney disease. I have been reading a book on controlling it with diet and even possibly stopping it. 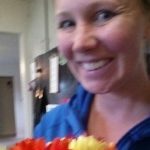 Need to know if there are recipes I could follow. Mainly what cheeses, lower protein meats Etc. Can you help me? Yes–we have a meal planner and tracker called DaVita Diet Helper. You can use it to look up nutrients in food, plan your meals and track what you eat then compare with your daily goals. Diet Helper also offers meal plans with recipes based on your protein and potassium goals. Where do I find recipes for cardiac & renal disease? We have you covered with the renal diet recipe–check out the DaVita.com kidney-friendly recipes. Many are also suitable for a cardiac diet because they are low in sodium and fat. If you have a dietitian ask for help selecting the best recipes. Here is an article on combining the 2 diets: “A Good Match: Merging the Heart and Kidney Diets“. Also, check out this Kidney Diet Tips post on the Mediterranean diet.